- Wipe the insides of cabinets and drawers with all-purpose cleaner or white vinegar diluted in water. Rinse and dry. - Use a toothbrush to clean along the edges and cracks. 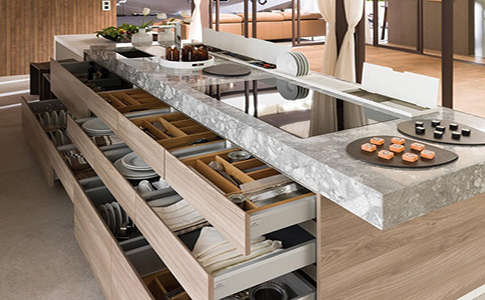 - Let the surface dry completely before placing any item back in the cabinets or drawers. - Seal unfinished wood or metal surfaces for easier cleaning and to avoid bacterial buildup. - Sand lightly and apply a coat of polyurethane (for wood) or an appropriate paint. - Install shelf paper to help preserve the surface and foster easier cleaning. Paper is inexpensive but cannot be washed and needs to be replaced frequently. - Vinyl is inexpensive and washable but might slide and bunch up in high-use areas. - Rubber is washable, slides less often, and offers some cushioning -- making it a good choice for areas prone to earthquakes. - Self-adhesive vinyl is washable and stays in place but might be difficult to remove if worn. - A low-tack self-adhesive vinyl is washable, durable, and able to be repositioned.